Let’s turn your party into a true spectacle with our wide range of flamethrowers that are perfect for different parties and occasions. There is no better way to making your private party unique than by deploying strategic flames. We focus in delivering personalized custom shows for different occasions. Graduation parties, wedding receptions, birthday parties. Name it. Whatever kind of party it is, our designers will always know what kind of party flame solution to deploy. We’ve created some of the very best flamethrowers and flame compositions to ensure that we can deploy impressive shows without putting your visitors at risk. Our design department adheres to the strict safety rules to ensure that all the equipment deployed to your party is up to standards. Combine this with the fact that all our flame operators are highly trained and certified and you can rest assured that everything will be in accordance to the plan. We understand that the best parties are born with creativity and innovation in mind. This is what you will be bringing into the party by hiring us. By letting our flame and pyrotechnics experts work hand in hand with your party planners, you will open up your event schedule to a breath taking combination of music, lighting, fireworks and most importantly flame effects. By putting the flamethrowers in perfect sync with the music or other cues in the party, we always ensure that the party flames are an integral part of the party. Not an oddly placed addition. You can always count on our vast experience in deploying flame effects in different types of parties. Since our designers can always come up with configurations and installations specific to your party. We will always take your unique party needs and budget into account. All you need to do is talk to us in advance and make us an integral part of your event planning. Our party flame solutions have helped different event organizers push the fun to the next level by giving the revealers something new to look forward to. We delight in making all your visitors happy. To us, any venue or local law enforcement rules are just but a challenge. We will always find a way to spice up your party with the right flame effects while keeping your safety on top priority. Our perfect understanding of the local environmental laws and regulation ensures that you will throw the perfect party while staying absolutely safe. We know how to give your wedding or graduation party the recognition it deserves. Don’t let your budget or safety precautions limit you. Our flame decoration installations and deployment team will always assess your party venue and advice you of the safest and most effective way forward. 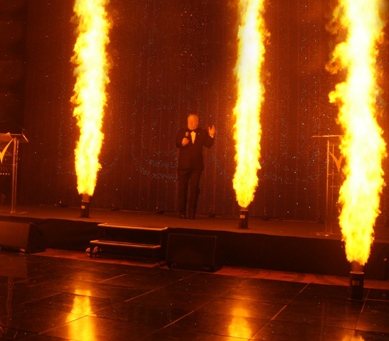 If your venue cannot accommodate our vast array of flame effects, we will help you choose new premises in time. Don’t let anything bar you from throwing the ultimate party. Think beyond the normal party decorations and effects. Think dramatic flames, fireworks and fog effects. Think us. We will make true your dreams beyond your wildest expectations.